The Wort Report: Beer and Donuts...Together At Last! 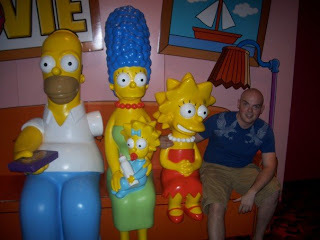 It's safe to say that anticipation for The Simpsons Movie, coming to theaters on July 27th, is at a fever pitch. 11 7-Eleven stores across the country have been converted to Kwik-E-Marts, Vermont has been named the official Springfield to premiere the film, and now Ben & Jerry's have announced a special ice cream flavor to celebrate everyone's favorite fat yellow, loveable oaf, Homer Simpson. For one day only, residents of Springfield, VT can treat themselves to "Duff & D'oh-Nuts," which will combine the tastes of chocolate donuts, and, well, beer. Unfortunately, this match made in ice cream Heaven will never be available again, so you're going to have to make that trek to New England if you want a taste of Simpsons history. After spending much of yesterday watching old episodes on DVD, Friday can't come fast enough. See how excited I am in the above pic?